Redwork is the original word for outline embroidery hand sewn with Turkey red thread in the late1800’s, but the name is still used today to describe outline needlework in any color. 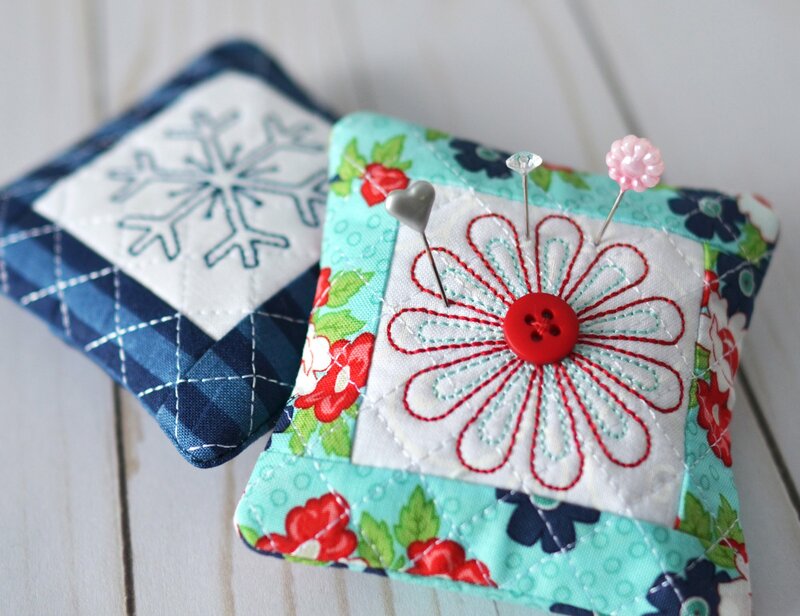 Choose a snowflake or flower for this petite pincushion, then let your embroidery machine get the stitches just right. Instructions for a simple muslin insert are included. We recommend filling the insert with ground walnut shells to keep the pins and needles sharp. Requirements: Supply list: 4 x 4 hoop Whisper web or now show mesh stabilizer to fit hoop. Fabric A: Outside Backing Pieces cut (2) 5" x 5" Border Pieces 2 & 3 cut (2) 4 1/2" x 1 1/2" Border Pieces 4 & 5 cut (2) 4 1/2" x 1 1/2" Fabric B: Background Piece 1 cut (1) 3 1/2" x 3 1/2"